I finished the cement work that I needed to do for the summer. 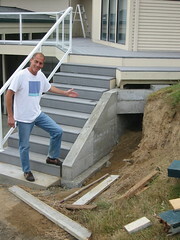 There is also a small slab under the stairs. It took five separate pours and a lot of wheel barrels full of cement to do the job. Makus and Calvin helped me mix the cement a couple of days. A friend generously loaned me a cement mixer. My next project will be a deck for another neighbor which I will probably start in a week or so.